The Bank of England is to create £75bn of new money in an attempt to revive lending and the battered economy. Bank Governor Mervyn King said the policy - called quantitative easing - was about pumping money into the wider system rather than simply to the banks. He said the approach would "eventually work" but admitted it was unknown how long it would take to have an effect. The approach, untried in the UK, was unveiled as the Bank cut interest rates from 1% to 0.5% - a fresh all-time low. Interest rates have now been reduced six times since October, and the latest cut was expected. Rates were cut to 0.5% - the lowest point in the Bank's 315-year history. The Bank also signalled the start of an untried policy - quantitative easing - to try and kick-start lending. Read our basic explanation of how quantitative easing works. Mr King insisted that increasing the amount of money in circulation was not an "experiment". "Nothing in life is ever certain, but these measures we think will work in the long-term," Mr King said. "I don't know how long it will take, much depends on the situation in the rest of the world. But if countries work together, these measures will I believe eventually work." Chancellor Alistair Darling said that increasing the supply of money was "absolutely essential" in order for the UK to recover from the recession. He acknowledged that the latest rate cut would be a blow to savers who faced another drop in the return on their money but said "the key thing for each and every one of us is to ensure we get the economy moving to help people and to help businesses grow". Quantitative easing is the process of increasing the amount of money in circulation in an attempt to revive the economy. While the Bank will initially add £75bn, Chancellor Alistair Darling has given it permission to extend this to up to £150bn. The idea is that if the amount of money in the system is boosted, commercial banks will find it easier to lend. 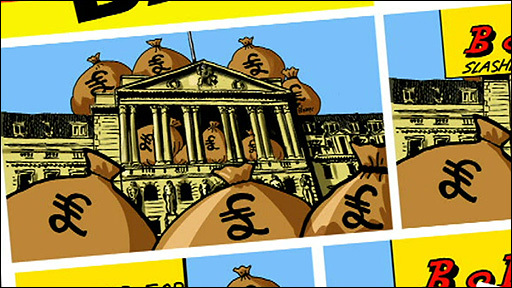 Quantitative easing is sometimes incorrectly referred to as printing money, but the Bank will not expand the supply of money by making new banknotes. Instead, it will buy assets - such as government securities (gilts) and corporate bonds. Similar measures were implemented in Japan at the beginning of the decade and are considered to have had limited success. BBC economics editor Stephanie Flanders said that while the initial size of the quantitative easing scheme was smaller than some analysts had expected, "it's a lot more than dipping their toes in the water". "Those who feared that the Bank would defeat the purpose of the policy by doing it only half-heartedly may be pleasantly surprised," she said. Philip Shaw, chief economist at Investec, said that quantitative easing "should in principle encourage the banks to lend to private sector agents such as households and businesses, stocking monetary growth and stimulating activity". Mr King sought permission from the Chancellor to start quantitative easing in a letter on 17 February. In his reply, Mr Darling said that in the "current circumstances" the measures were now "appropriate". Both letters were released on Thursday. Meanwhile, Shadow chancellor George Osborne said about the measures: "I don't think anyone should be pleased we have reached this point. It is an admission of failure." Liberal Democrat Treasury spokesman Vince Cable said that increasing the amount of money flowing into the economy was now the "only clear option". "The Government must be careful that this kind of radical action doesn't quickly turn deflation into high inflation," Mr Cable said. Business groups have attacked the recent cuts in interest rates, saying they have done little to encourage banks to lend more. Others argue that they are unfairly hurting the returns of savers. "Today's decision is a kick in the teeth for savers who will see their already diminished interest payments fall even further," said Adrian Coles, director general of the Building Societies Association. The Council of Mortgage Lenders (CML) said the latest cut would be a "double whammy for prospective mortgage borrowers". "This latest cut presents immense challenges for lenders whose margins are already squeezed as a result of previous reductions, leaving little scope to lower discretionary mortgage rates further," said CML director general Michael Coogan. "Savings are the lifeblood of mortgage lending, and unless lenders can offer competitive rates to savers their ability to offer new mortgages is restricted." Ian McCafferty, CBI chief economist, said the continuing rate cuts were "becoming less and less effective as a means of stimulating the economy". "Though this latest cut will help support business and consumer confidence, it is unlikely to have a dramatic impact on the cost or availability of credit," he said. The Bank has had the room to cut interest rates because inflation has fallen on the back of reduced energy costs. The most recent official figures showed that consumer prices index (CPI) inflation fell for the fourth month in succession in January to 3%, from December's 3.1%. However, CPI inflation still remains above the government's 2% target.